The Middle East Policy Network, Inc., is a nonprofit public benefit corporation registered in the State of California, and does business as Al-Shabaka, The Palestinian Policy Network. 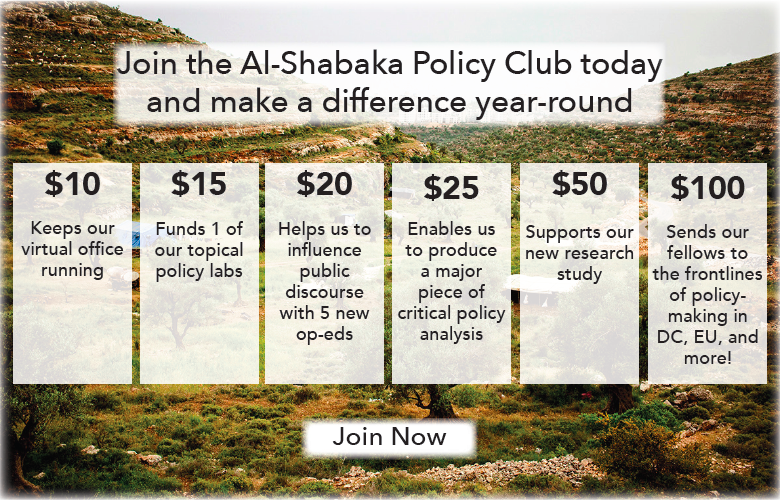 Al-Shabaka is fully funded through the contributions of its members and other individual and institutional supporters of its mission and goals. The Al-Shabaka Board of Directors would like to personally thank Mr. Abdul Mohsen al-Qattan for his faith in the project. Click here to read Al-Shabaka's 2017 annual report. For earlier reports, click here for 2016 and here for 2015. Download a PDF of our informational flyer, good for printing and distributing.